The Toddler Room is one step closer to being a big kid! It is a challenging and inviting room for your child who is figuring out new things they can accomplish. This room has children between the ages of 15 and 24 months old. They are separated into two groups according to their age for activities throughout the day. The young toddlers participate in activities involving sound, texture, vocabulary and movement. The older group of toddlers focus on learning vocabulary, numbers 1-10, animals, shapes and body parts. Each week our toddler teachers prepare a lesson plan to progress your child in all the developmental areas. They also include enrichments for each lesson including Spanish, sign language, songs and art. Toddlers play on their own separated playground from all of the other children. 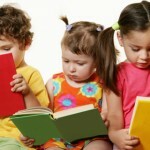 Once your toddler turns the big 2, they will begin transitioning into the Junior Preschool room. In order to prepare them for this transition we practice our manners, throwing away our own trash, washing our hands and using our listening ears.